I tend to be a bit slower to comment publicly on news – especially contentious news. It’s not that I don’t have opinions. But especially when my reactions are strong ones, I usually want to sit on them for a bit, sift through why I am reacting so strongly, and only then can I express that reaction coherently. Of course, I recognize that we’re missing some key pieces of info. 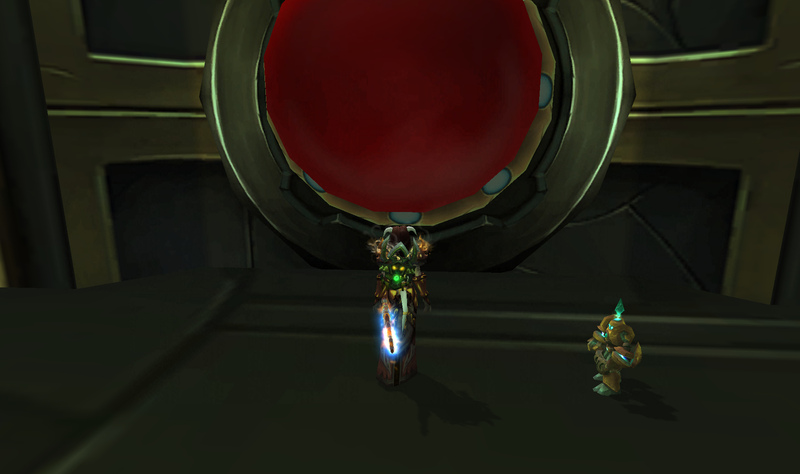 We don’t know when T13 is coming out, how long it will be on the PTR and exactly when this tier will become obsolete. I was on vacation when T12 came out and so to me, it’s had a run from July to September. Two and a half months feels really short. I didn’t understand why they’d sweep the proverbial tier rug out from under our feet. But do you want to know the real, naked and honest truth? I was upset because we were late, and I knew it, and I hated to admit it even to myself. You’re seldom going to see a blog post where someone admits (especially a guild leader) that their progression just hasn’t been going the way they’d imagined. Granted, I don’t usually say much about my raid team anyhow; kill shots aren’t exciting for anyone but the people in them. When we achieve a particularly awesome kill I might write about and exult in it a bit (I was so proud when we downed Heroic Lich King, nothing could have prevented me from writing about that). This is the other side of that coin; the dirty, reluctant and secretive side. The uncertainty, the disappointment – yes, dare I say, even shame and guilt. I was the guild leader of a raiding guild that hadn’t killed a new boss in a month. That is the secret that I wouldn’t write about. It was eating away at me. There are certain acknowledged risks that go along with pushing that big red button. I could go into all the reasons (excuses) why BT was stuck in the mud, spinning its wheels, although it’s a timorous beast. Who can say exactly why a raid team may stall? It’s seldom any one reason. Was it the roster changes? Scheduling conflicts? Lack of interest? It’s almost impossible to pinpoint just one thing, and anyway, excuses are tedious and boring. But you start to doubt yourself, and you feel others’ doubt beginning to build, too. Please don’t mistake me. I am incredibly proud of my team and the people on it. The other reason I didn’t want to write this was because I never wanted to make them feel bad, or as if I had lost faith in them. Quite a few guildies read my blog. To write about how we’d been struggling felt like it would be a betrayal, and incredibly demoralizing. It could become a self-fulfilling prophecy. If your guild leader expresses doubt about you, wouldn’t you start to doubt yourself too? It’s not a pleasant feeling. It’s even worse feeling like your own self-doubts and frustrations are making you act like the worst version of yourself. I’ve always been (or tried to be) the kind of person who is honestly happy for the successes of others. In order to do that, you need to come from a strong sense of self. You can’t let your confidence be shaken, nor start to feel like others’ successes are a reflection of you. They aren’t, unless you let them be. But the fact is, we’d still only downed Heroic Shannox after a month of work on other heroic bosses. It eats away at a person, and it eats away at a guild, slowly eroding the confidence that lets you move on to other kills. The longer you’re there, the deeper you become mired. “These nerfs are for you, because you haven’t downed the content in the allotted time frame. You are the intended audience and you need them.” I’m sure I’m not alone in feeling this way. Whether you are working your way through normal or heroic mode raids, it’s hard not to feel as if nerfed content is a pronouncement on you. For me, I found myself wondering, what is a heroic raid guild that doesn’t kill heroic bosses? I had to think long and hard about this, and the answer I came up with is that it’s a heroic raiding guild that could, perhaps, at this time – benefit from some nerfs. Whatever the reasons – and I don’t want to delve into them here, because our group is in the process of stabilizing once more – we’ve really struggled to move through this tier. We mowed over the normal modes for the most part and had great momentum going into heroics. It’s as if we were caught somewhere in the middle; quite strong for normals, but maybe not quite strong enough for all of the heroics. So, I was immediately angry, and then slowly started to drift towards acceptance. As I read some thoughts that other people had on the subject, I realized that I have to focus on what is important: the long-term strength and success of the team. We faltered somewhat in T11, not completing the heroic tier (something we’d not failed to do since Ulduar), and that was a blow to morale. We’d hoped to make a strong start in Firelands (and I think we did) but it’s tough to predict just what is going to happen – who is going to leave, who is going to be out of town, whatever. I’m not looking to point fingers at my people. The funny thing is, the guild has changed completely. It’s not the same guild it was even a year ago. Many of our long-term members stopped raiding, replaced by new people who – no matter how awesome – need time to click, and build a new team. This whole process has helped me to realize some truths. Sometimes it’s better to pick yourself up and build something for the future. So we weren’t on the bleeding edge of content for this tier. It’s a fact. But so what? Tons of guilds haven’t even made it this far – they’ve folded, collapsed, or exploded. We still have a full raid group. We’re still here. 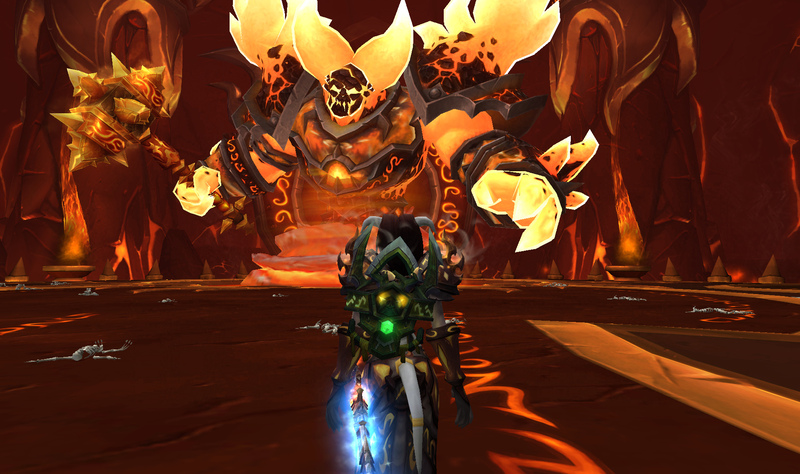 We’ve consistently cleared through Ragnaros for many weeks in a row, and our raid has been gearing up nicely as a result. Success is all relative. A week ago, I was upset because we couldn’t move past 1/7 heroics. None of us joined this guild to only kill 1/7 heroics. The announcement of the nerfs and other changes we’ve been making really galvanized the team last night and we had a breakthrough of sorts – finally pushing through to kill Heroic Alysrazor. Nerfs or no nerfs, we’re going into next week with one more kill under our belts. That feels good, it feels like progress, which is why I play this game. Will I be puffed up and brag about our progress post-nerf? Probably not, because I will know that these kills will be much easier than kills made while the content was still at full-strength. But there’s a difference between not boasting and not being proud to complete things at all. These nerfs may be just what we need to continue pushing and have challenges to face leading up to T13 – and when T13 does come, we’ll have all the gear we can muster, and the experience of this tier, and we’ll be ready for it. This time around, they nerfed the content when we were 28% of the way through heroics (or 42%, if Domo goes well this week). If next tier they pull the “to the ground, baby” move again, I’ll consider it a success if we are further through that tier than we were this one. Measurable, steady improvement is highly underrated. I’m still proud of my team and what we have accomplished, and what I know we will accomplish in the future. Besides that – we can’t be the only group that didn’t go extremely far. There has be a good reason for Blizzard to be nerfing the content before it’s truly through. Maybe guilds that only want to do normals couldn’t get as far in them as they would have liked. Maybe, with reduced raid schedules, not everyone is able to go through the whole thing. Obviously, Blizzard thinks so, and they’re taking this action as a result. It’s going to benefit my guild, and I’m okay with admitting that. It turns out that maybe – if you shed light on such a secret – it might not be so shameful after all. We’ve all been there. You show up ready to raid. You have read the strats for the progression fights. You’ve been talking about how to better execute fights that you’ve already downed. You have flasks, you have food. You have nine or twenty-four other people. Or maybe you don’t even get to that point. Maybe someone’s internet is down and you can’t get ahold of John to step in. Someone disconnects as you pull the boss or someone has an addon problem or someone makes a mistake on something you’ve done a million times before. Whatever the reason, something is just off. You’re in for one of those nights. I wish I had the magic recipe to prevent them. I don’t. Sometimes storms are hitting several areas. Tonight the storm was in our area – massive chunks of hail pounding on the roof so hard during Shannox that I had to turn my sound up just to hear the aural cues I am used to! Thankfully we didn’t disconnect, and no one had any technical difficulties. Regardless, for us it was one of those nights. Call it a full moon, call it bad luck, call it a combination of factors – we’re still getting to know our new raiders, we had one more melee than we usually do, we made a mistake on assignments, we swapped healers to roles they weren’t used to, and tanks to roles that they weren’t used to. We started the raid night with high hopes for a certain number of bosses that we didn’t achieve. It’s the kind of night where you finish and can feel the collective sigh of relief and discouragement over voice chat. Everyone’s demoralized. Where do you go from there? There are a few ways to handle it. You could cascade into a doubt spiral, second-guessing everything that happened and your role in it. You could lay blame, you could pout or gnash your teeth. Here’s what I do. No, really. You may feel like there is no other single raid group that has struggled as your group struggled on that night. Trust me on this – Vodka has nights like this. No one plays perfectly all of the time. I challenge you to show me a raid group that hasn’t had a crappy or an off night. (Okay, an off night for Vodka doesn’t mean the same thing as it does for other raids, but that’s not the point). We all have times where we feel like we didn’t play to our potential, that we could have done better, that we failed. We’re human. It happens. So then what? Give the dog a carrot. Open the back door and take deep breaths of fresh air. I’m kind of a hippy like that, so I have essential oils (mint!) and I’ll put a dab on my wrists or neck or temples. Mint and citrus smells can help reduce stress and aid focus. 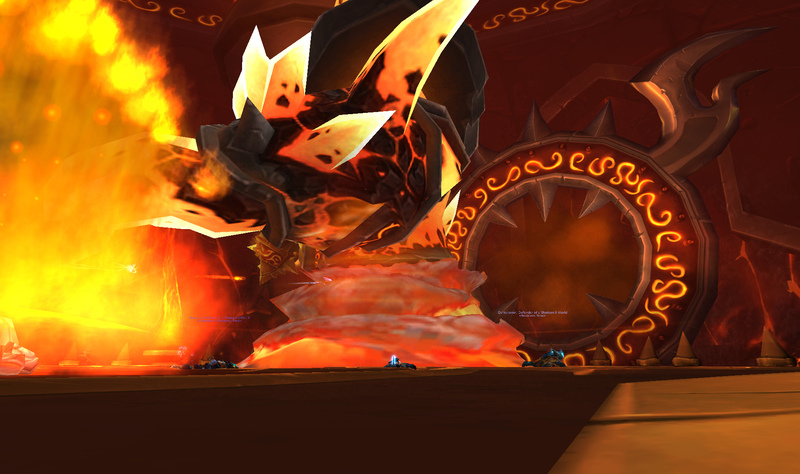 Lavender is calming, unlike the Firelands, which is…well, on fire. Sometimes you just need to get your body thinking about something else. I like to stretch my legs and move around during breaks if I can. Long periods of sitting combined with tension can lead to muscle cramps or aches. Focusing on something else even for a few minutes can help you to do better when you come back and sit down. If you’ve been beating your head against a boss wall for hours and you aren’t seeing any progress, don’t be afraid to tackle something new. It may not result in a kill, but at least it’ll present new frustrations. If your faction has Tol Barad, go do a Baradin Hold run. Kill some more trash. Even switch instances if that’s an option and you have the time to do it. Was your night really all that bad? For our raid night, we didn’t kill all the bosses we would have liked, but the ones we did kill we killed pretty cleanly. I healed a different tank than I usually do on Shannox; our other tank healer got a chance to experience the damage patterns of the opposite tank as well. Beth’tilac went down very easily, and it was again a new tank doing the “upstairs” task. It could have been worse. We could have killed nothing. Or one less boss, or two less bosses. We got some valor points. Trash went very smoothly. I was mostly happy with P1 of Alysrazor as well. We’ve killed these bosses before. We will kill them again. I already know what was going wrong with Rhyolith. We made some poor calls on assignments. The melee are going to have to put their heads together when it comes to driving duties. I did not do the best I could in my new role. So there’s a few lessons there, but most importantly I want to find out was going on with Baelroc. What was I doing wrong? Why was it so hard at first, and what can I do better for next time? Depending on how you work, it might be a good idea to wait before you proceed with this step. If you go in still frustrated, tired or upset, you’re liable to just beat yourself up over things you can’t change. The single best thing you can do, I think, is just sleep on it. You’ll be able to process tomorrow what may seem hopelessly aggravating right now, because it’s still too close. Re-evaluate your performance and the overall raid performance the following day when you have a clear head and a rested perspective. Ask yourself, was it really that bad? Even if it was, it’s still over, and tomorrow is another raid day. So how about you? What do you do when your group is having one of those nights? Don’t try to tell me you never do, either! I know you’re fibbing.